Beautiful, large double, white/pale pink flowers, featuring irregular rose coloured stripes towards the outer edges. Mid Spring flowering. 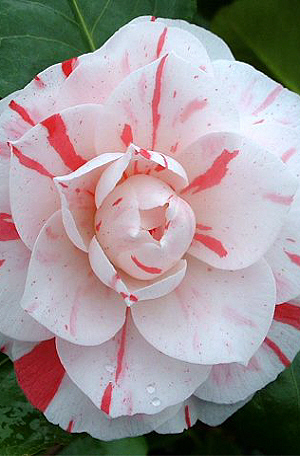 Camellias have been a favourite of British gardeners for generations. Their waxy, colour-packed blooms and dark, glossy, evergreen leaves provide a pronounced beauty in any garden. The 'Blood of China' is noted for it's medium, formal-double, clear brick red flowers.